The infraorbital nerve block is often used to accomplish regional anesthesia of the face. The procedure offers several advantages over local tissue infiltration. A nerve block often achieves anesthesia with a smaller amount of medication than is required for local infiltration. In addition, unlike local tissue infiltration, nerve blocks can provide anesthesia without causing tissue distortion. Therefore, the infraorbital nerve block is a convenient alternative for situations such as facial lacerations in which tissue distortion would be unacceptable. In general, regional anesthesia is ideal when the area of interest is innervated by a single superficial nerve. The infraorbital nerve supplies sensory innervation to the lower eyelid, the side of the nose, and the upper lip (see image below). Since the infraorbital nerve provides a considerably large area of sensory innervation, it is a prime candidate for a regional nerve block. A successful infraorbital nerve block provides anesthesia for the area between the lower eyelid and the upper lip. Area of anesthesia for infraorbital nerve block. 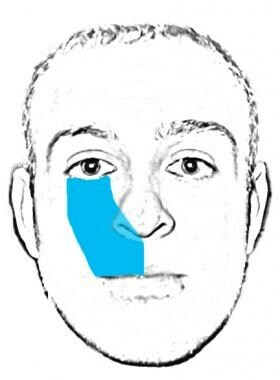 The trigeminal nerve (cranial nerve V), provides sensory innervation to the face. The second division, the maxillary nerve (V2), exits the skull from the foramen rotundum. 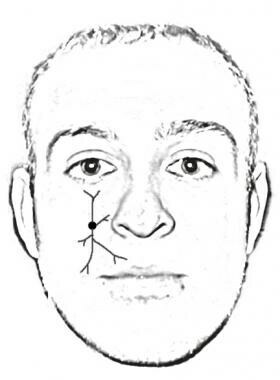 After giving off numerous branches, the maxillary nerve eventually enters the face through the infraorbital canal, where it ends as the infraorbital nerve (see image below). The infraorbital nerve supplies sensory branches to the lower eyelid, the side of the nose, and the upper lip. Most local anesthetic agents share the same basic chemical structure, which consists of an aromatic ring, linked to an intermediate chain, linked to a hydrophilic amine segment. The intermediate chain between the aromatic and hydrophilic segments is either an ester or an amide. The chemical structure of this intermediate group classifies the agent into the amide group or the ester group. This structural difference determines the pathway by which the agent is metabolized and its allergic potential. For example, amino amides undergo hepatic metabolism, whereas amino esters are metabolized in the plasma via pseudocholinesterases. Hydrolysis of amino ester compounds yields para -aminobenzoic acid (PABA), a well-known allergen, as an intermediate metabolite. Thus, amino esters are significantly more likely than amino amides to cause true allergic reactions. Examples of commonly used esters include tetracaine, procaine, chloroprocaine, cocaine, and benzocaine. Members of the amide group include lidocaine, bupivacaine, mepivacaine, prilocaine, and etidocaine. A simple way to help decipher which drug belongs to which class is to remember that the letter i appears twice in the spelling of the amino amides. The toxicities associated with local anesthetics are cardiovascular and neurologic. Methemoglobinemia can occur with use of these agents, though it is rarely clinically significant. An infraorbital nerve block requires 1-3 mL of the chosen anesthetic agent. Lidocaine (Xylocaine) is the most commonly used agent. The onset of action for lidocaine is approximately 4-6 minutes. The duration of effect is approximately 75 minutes. Bupivacaine (Marcaine) is another frequently used anesthetic agent. The onset of action of bupivacaine is slower than that of lidocaine. The duration of anesthesia of bupivacaine is about 4-8 times longer than that of lidocaine. The dose of anesthetic used in typical volumes for this procedure is not toxic. The patient should be positioned either supine on a stretcher or comfortably seated in a chair. Apply cotton-tipped applicator soaked with topical anesthetic to the mucosa opposite the upper second bicuspid (premolar tooth) for 1 minute. To palpate the infraorbital foramen, have the patient look straight ahead and imagine a line drawn vertically (sagittally) from the pupil down toward the inferior border of the infraorbital ridge. Keep the palpating finger in place over the inferior border on the infraorbital rim for the remaining steps. Retract the cheek and introduce the needle into the mucosa opposite the upper second bicuspid approximately 0.5 cm from the buccal surface (see images below). Infraorbital nerve block, intraoral approach. Keep the needle parallel with the long axis of the second bicuspid until it is palpated near the foramen. (The approximate depth is 1.5-2.5 cm.) If the needle is extended too far superiorly and posteriorly, the orbit may be entered. Once the needle is positioned properly, aspirate to ensure that the needle is not within a vessel. 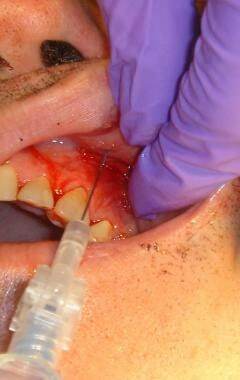 Inject 2-3 mL of anesthetic solution adjacent to the foramen. Take care not to inject into the foramen (which may result in swelling of the lower eyelid) by keeping the palpating finger firmly on the inferior orbital rim. 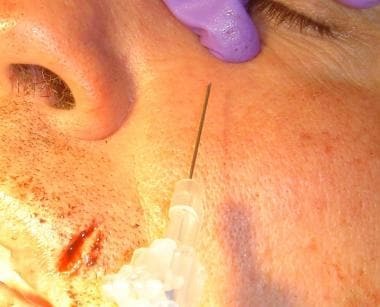 During the extraoral technique, the needle is in very close proximity to the facial artery. Because of this proximity, avoid adding vasoconstrictors to the anesthetic agent. Use the previously described landmarks to locate the infraorbital foramen. Prepare the skin overlying the infraorbital foramen with povidone iodine (Betadine) and sterile gauze. Using sterile technique, insert the needle through the skin, the subcutaneous tissue, and the quadratus labii superioris muscle (see image below). Technique for extraoral infraorbital nerve block. Aspirate to ensure the needle is not within a vessel. The facial artery and vein are very close to the needle in this position. Inject the anesthetic solution. The infiltrated tissue appears swollen. Firmly massage this area for 10-15 seconds. If the nerve block is unsuccessful, or if the exact location of the infraorbital foramen is unclear, a field block is a useful alternative. 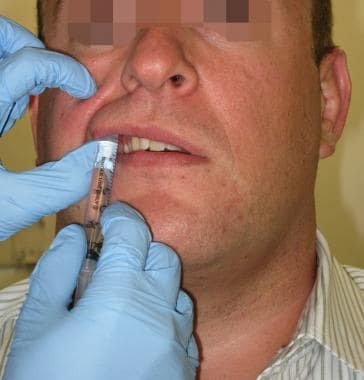 To perform a field block, inject 5 mL of anesthetic solution into the upper buccal fold in an arc-shaped distribution. Massage the area for 10-15 seconds to speed the onset of anesthesia. Although this technique is not as precise as the previously discussed nerve block, it often accomplishes the same anesthetic effect. What is an infraorbital nerve block? What is the anatomy of the infraorbital nerve, relevant to infraorbital nerve block? What are indications for infraorbital nerve block? What are contraindications to infraorbital nerve block? What are the chemical properties of anesthesia used in infraorbital nerve block? What types of anesthesia are used in infraorbital nerve blocks? What are the possible adverse effects from the anesthesia in infraorbital nerve block? What is the role of lidocaine in the administration of infraorbital nerve block? What is the role of bupivacaine (Marcaine) in the administration of infraorbital nerve block? What equipment are needed to perform an infraorbital nerve block? How is the patient positioned for an infraorbital nerve block? How is an intraoral infraorbital nerve block administered? How is an extraoral infraorbital nerve block administered? What are the indications for a field block following an infraorbital nerve block? What are the possible complications of infraorbital nerve block? Aggarwal A, Kaur H, Gupta T, Tubbs RS, Sahni D, Batra YK, et al. Anatomical study of the infraorbital foramen: A basis for successful infraorbital nerve block. Clin Anat. 2015 Sep. 28 (6):753-60. [Medline]. Gray H, Lewis WH. The trigeminal nerve. Gray's Anatomy of the Human Body. Bartleby.com. Available at http://www.bartleby.com/107/200.html. Accessed: May 16, 2008. Amsterdam JT, Kilgore KP. Regional anesthesia of the head and neck. Roberts JR, Hedges JR, eds. Clinical Procedures in Emergency Medicine. 4th ed. Philadelphia, Pa: WB Saunders Company; 2004. 552-66. Crystal CS, Blankenship RB. Local anesthetics and peripheral nerve blocks in the emergency department. Emerg Med Clin North Am. 2005 May. 23(2):477-502. [Medline]. Trott AT. Wounds and Lacerations: Emergency Care and Closure. 2nd ed. St. Louis, Mo: Mosby; 1997. The authors would like to acknowledge Dr. Albert Izzo for his contributions to this article. The authors and editors of eMedicine gratefully acknowledge the contributions of previous author Michelle Marie Davitt, MD, to the development and writing of this article.